The type of public campaign finance model that Governor Cuomo allegedly supports – the NYC 6-to-1 match of small qualified contributions – will do little to curb the influence of special interest funders in dominating the State Capitol. The Clean Money Clean Election system of public financing – which provides equal public funding grants for candidates who qualify with a reasonable number of nominal private donations – is much stronger in reducing the role of special interests in buying politicians. A more fundamental reform would be for NY – and the US – to finally join the overwhelming majority of the world’s other democracies in moving to a proportional representation system of elections rather than our antiquated and undemocratic winner-take-all system. Proportional representation (parties get seats based on their percentage of votes) creates legislative bodies that much more accurately reflect the political perspectives of the voters than the US system of giving voters the choice between two parties both dominated by special interest money. Winner-take-all over-represents majorities and under-represents minorities to make most political districts one-party states. For example, the 2-to1 advantage of Democratic enrollment over Republican enrollment in NYC currently gets magnified into a 12-to-1 advantage of 47 Democratic councilors to 4 Republican councilors, under conditions of public matching funds and term limits. With proportional representation, there would no doubt be many third party councilors as there were when NYC had it between 1937 and 1945. The other big elephant in the room is the US Supreme Court and their devotion to the concept that the rich and powerful should have the right to buy our government as a exercise in their first speech rights – regardless of whether this means that the rights of the 1% trumps the rights of the other 99%. Since Watergate the Supreme Court has repeatedly struck down efforts by Congress and state government to curb the role of campaign contributions. And with its Citizens United ruling that corporations are people with first amendment rights to buy elections, the Supreme Court opened up the floodgate to allow special interest to flood into the political system. Amending the US Constitution is a very difficult task. But realistically anything short of such an amendment will be unsuccessful in establishing democracy in our electoral system. Overturning Citizens United is not enough. Overturning Citizens United just takes us back to 2009, when the corporate rich still bought elections. Overturning Citizens United is all the proposed state legislative resolution and all of the proposed constitutional amendments before Congress do. We need a constitutional amendment that really does establish that money is not speech, and that only human beings, not corporations, are entitled to constitutionally protected rights. The best system of campaign finance reform remains a Clean Money Clean Election system such as Arizona and Maine, where candidates qualify for funding based on raising a certain number of nominal contributions (e.g., $5). The Supreme Court did unfortunately strike down one provision of the Arizona law, which gave the publicly financed candidate more money if their opponent decided to self-finance (e.g., Mike Bloomberg), saying once again that rich people have a first amendment right to buy elections. Still a Clean Money system can mitigate this decision by provided public funding sufficient to enable candidates to get their message out to the voters in their district. Though the NYC public campaign finance matching model has the support of many advocates, the reality is that after more than four decades of such reforms being enacted following the Watergate scandal, the role of special interest money is stronger than ever. While the latest round of reforms are invariably hailed by the media and “good government groups” as a major breakthrough, before the ink is even dry the special interests and campaign operatives are figuring out new ways to exploit loopholes. When Congress limits the size of individual donations, the solution for influence peddlers is bundlers, where one donor gets other in the same industry to pony up together to maximize their influence. Or the candidates tells funders how to donate to party committees once they reach the limit for individual candidates. The money continues to flow in ever larger amounts. Several recent “reform deals” in NYS lowering campaign contribution limits still have left them way above federal limits; in reality for most candidates, the limits are fund raising goals rather than restrictions. In New York, the big rollers are permitted contribute up to $102,300 to each of each party’s state and county committees, who turn around and spend it on their candidates. While Governor Cuomo failed to advance campaign finance reform over the last year, he has effectively silenced most campaign finance reform advocates from publicly pushing him since they are now his “partners”. With most advocates silenced, Cuomo has done a masterful job of exploiting loopholes in existing campaign finance laws to help his supporters give him massive amounts of donations in violation of the strict letter of the law. 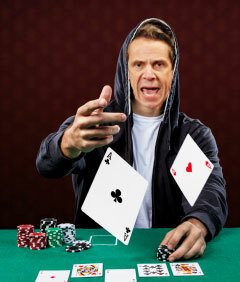 According to a report from NYPIRG, since 2010, 142 people or organizations gave Cuomo $8.4 million in donations of $40,000 or more, One real estate developer gave the governor $500,000, through the shell game known as limited-liability corporations; this allowed him to evade the nominal (and scandalously high) limit of $60,800 per donor per statewide race. We saw a similar pattern a decade ago when Carl McCall (D/WFP) in his race for Governor was trumpeted by the same groups as the champion for campaign finance reform while he was drawing national scrutiny for being the biggest abuser of pay to play (raking in contributions from companies getting contracts from him as State Comptroller). Supporters of the NYC 6-to-1 matching model point out that the system has increased the diversity of those contributing to candidates, and that smaller, less wealthy donors, can play a greater role, especially in the smaller races for City Council. Studies of the impact of public campaign finance reforms that have been enacted have varied in their findings. Two studies by the General Accounting Office (GAO) found no real impact. Other studies have shown an increase in the diversity of donors, including the number of non-wealthy donors. The laws generally have not been favorable to third-party or independent candidates. Some studies have found some more competitive races and a growth in candidates; others show the same rate of re-electing incumbents. Certainly in NYC term limits have had much more of an impact than the six-to-1 campaign contribution match. 1. High qualifying thresholds that make it an incumbent re-election fund. For NYC Council districts with populations of 157,025, it takes $5,000 to qualify. For State Assembly districts with populations of 129,089 it takes $10,000 to qualify. For State Senate districts with populations of 307,356 it takes $20,000 to qualify. 2. It increases the funding disparities among qualified candidates. A $10,000 difference between a candidate with $10,000 qualified for matching funds and a candidate with $20,000 qualified for matching funds is increased into a $70,000 difference of $70,000 vs. $140,000. 3. Publicly funded candidates can receive backdoor private financing from donations from the rich and corporations channeled through party committees. The public funding bill introduced in Congress is a clean money bill, Fair Elections Now Act (HR 269), not to be confused with NY’s proposed Fair Elections Act.